WHAT ARE THEY DOING WITH THE BOATS? Guests returning early from a shore excursion or from exploring a port of call sometimes find their ship surrounded by lifeboats. Perhaps something has happened to the ship or maybe the crew is just passing the time until the guests come back aboard by going on a boat ride. In fact, such displays of seamanship are crew boat drills. The drills also serve to ensure that the lifeboats and other safety equipment are in working order. Typically, a cruise ship will exercise the lifeboats on one side of the ship one week and the boats on the other side the next week. The boats are lowered into the water, unhooked from their davits and then sailed around the harbor. When the crew have had enough practice driving the boats about, they are once again hooked to the lines from the davits and raised up into place. On Adventure of the Seas, the crew members manning the lifeboats are not the ship's sailors but rather members of the hotel department including cooks, entertainment staff and housekeeping personnel. “If you have an emergency, the deck department and the engine department will be involved in the emergency. They will be involved in fighting fires etc.” explains Captain Gronhauag. “If you have an emergency where you need to abandon ship, you don't need the cooks to continue any cooking onboard. They are the ones who can be preparing the lifeboats.” Of course, they perform this work under the supervision of one of the ship's officers. Each lifeboat on Adventure has a capacity of 135 people. A crew of seven serves each boat including a boat commander and assistant commander. Each crew member has a specific set of responsibilities such as unhooking the boat from the lines that connect it to the davits once the boat is in the water. In order to be a boat commander, a crew member must pass both a written and a practical test. But don't cruise ships, including some Royal Caribbean cruise ships, routinely use their own boats for tendering? 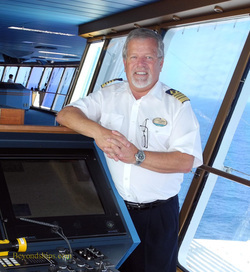 Captain Gronhaug answered by pointing out that the boats that such ships use for tendering are specific boats that are actually classified as both tenders and lifeboats. Thus, the drills train the crew as to what to do in case of emergency. Moreover, on Adventure, they make clear that safety is everyone's responsibility. ﻿Above: The crew practice maneuvering the boats in the space between Adventure of the Seas and﻿ Disney Magic. ﻿Above: One of Adventure' s lifeboats maneuvering.